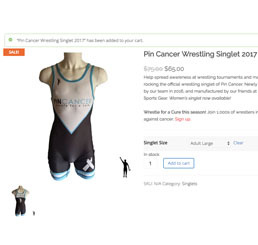 Pin Cancer was founded in 2011 by former wrestler Dan Tramontozzi after getting the news that his mother had been diagnosed with Stage 3 Ovarian Cancer. Since then, the organization has grown from a small grass roots campaign in Northern, NJ to a nationally recognized wrestling nonprofit. The organization is founded by Dan Tramontozzi & is soon incorporated. 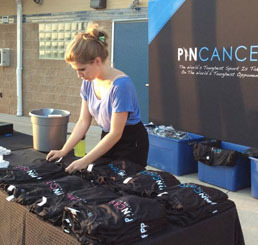 Later in the year, Pin Cancer files for 501c3 nonprofit status and is granted the status by the IRS. Dan borrows $2,000 to purchase shirts. The organization starts out selling t-shirts at youth and high school wrestling matches in North, NJ to help spread awareness and funds. The $2,000 is paid back within 2 weeks. 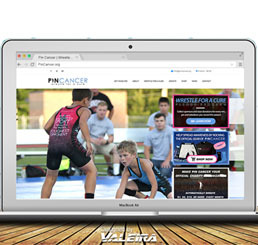 Pin Cancer enhances social media interactivity through a newly revitalized website designed and built by Pin Cancer’s own team. The organization is starting to gain followers on Facebook & Twitter. From holding fundraisers, designated matches and tournaments as Pin Cancer events, to selling branded merchandise, the PC brand has been translated in many ways. It is now active in 22 states. A new logo is introduced further focusing brand awareness. 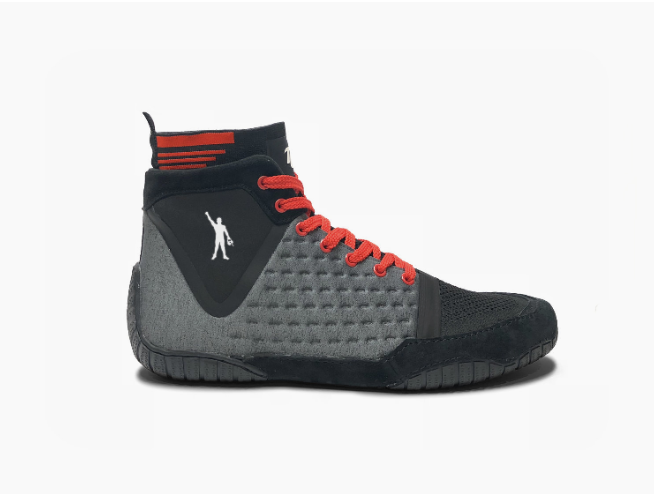 Additional virtual platforms are also added by way of an online store to sell merchandise. This increases the organizations reach by 65% in the first month of sales. 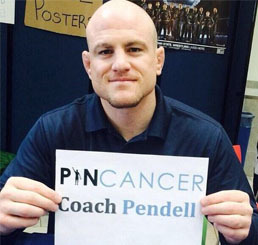 Cael Sanderson (head coach of Penn State Wrestling) shows his support for PA high school wrestling coach – Coach Pendell who is battling cancer. 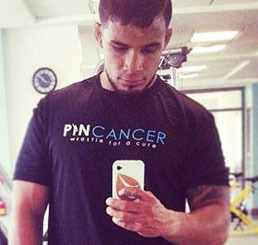 UFC Fighter Dennis Bermudez becomes a Pin Cancer Ambassador. He sported his Pin Cancer shirt during fight camp while the UFC was filming a promo. Pin Cancer has shipped orders to every state in the U.S. including Canada and the U.K. PC is now active in all 50 states. The online store will generate over $50,000 in the first year. 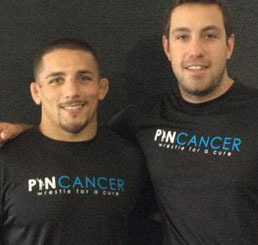 NCAA Champion and 2016 Olympian Frank Molinaro becomes a Pin Cancer Ambassador. 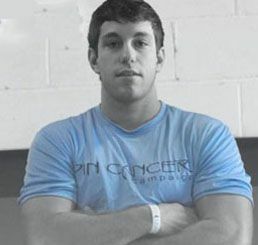 He also is a guest clinician at a Pin Cancer Wrestling Camp held in NJ. 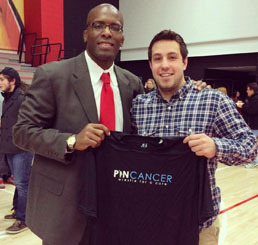 Univeristy of Maryland joins the fight and dedicates a home match each season to help raise funds for Pin Cancer. The team raised over $2,000 in a dual again Duke. Head Coach Kerry McCoy becomes a PC Ambassador. The organization is recognized in the Hall of Donors at Morristown Medical Center in NJ. 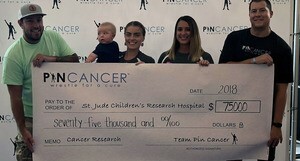 Pin Cancer’s CEO, Dan Tramontozzi travels to St. Jude Children’s Research Hospital to meet with Senior Philanthropist Erin Devine and to present a donation of $25,000 to the hospital. Pin Cancer trademarks its logo. Pin Cancer board members agree to raise funds for St. Jude Children’s Research Hospital allowing the organization to be recognized as a charitable partner of St. Jude. 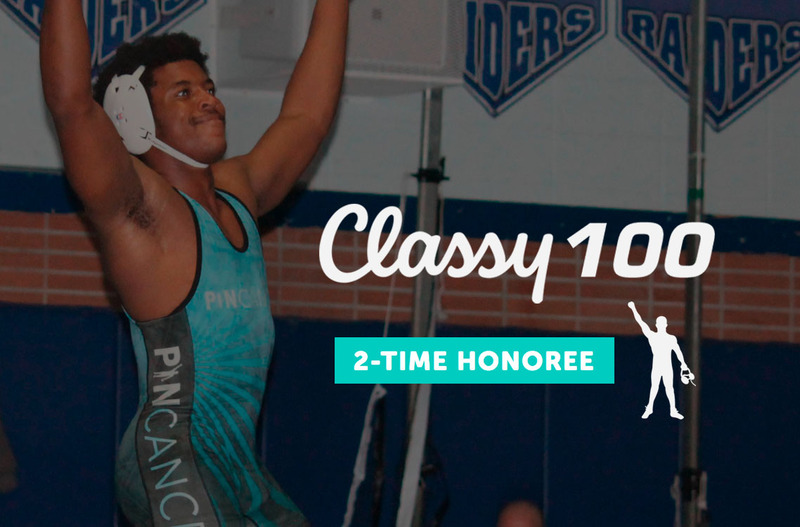 Pin Cancer hosts its first ever Pin Cancer National Tournament on the east coast. Wrestlers, representing 12 different states competed. 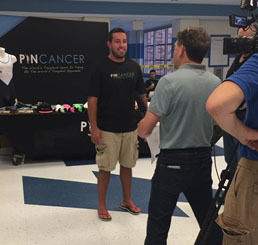 Rival NJ high school teams Phillipsburg & Warren Hills host their 4th annual Pin Cancer Summer match. The two teams raise on average over $3,000 each summer during this event. The Board of Directors elect two new Board Members to help build and grow the organization and its mission. The organization also brings on its first marketing intern to help grow the cause. 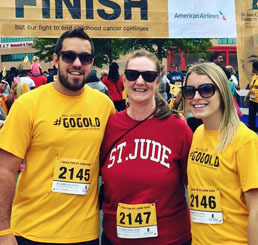 Pin Cancer CEO Dan Tramontozzi is invited to tour St. Jude as well as take part in their walk/run. Dan joined top donors of St. Jude and met with Executive Director James R. Downing during his visit. “Wrestle for a Cure” is trademarked. A process that took 2 years because it was opposed by Susan G Komen. Horace Mann High School in NY raises over $30,000 on the season through pledges. The school would continue their fundraising the following year to tack on another $14,000 to their total. 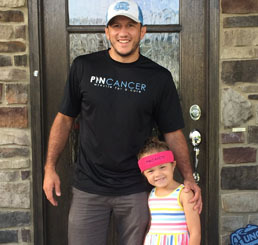 Olympic Gold Medalist – Kendall Cross & Olympic Bronze Medalist – Coleman Scott join the team and become Pin Cancer Ambassadors. Both have been affected first hand by cancer. 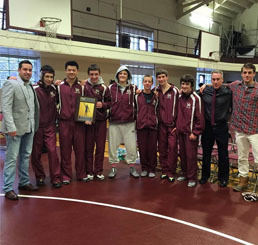 Pin Cancer is recognized by an engraved plaque at St. Jude in honor of Margie Tramontozzi. 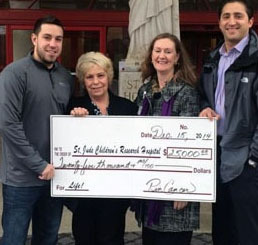 Pin Cancer’s CEO Dan Tramontozzi is recognized as an Ambassador by St. Jude Children’s Research Hospital. The organization introduces its new online software that allows wrestlers to create their own fundraising pages to help generate donations. 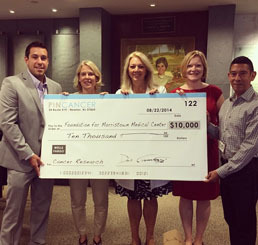 Pin Cancer partners with MasterCard & Simplify Commerce to enhance online store’s payment processor. A new website & online store is also launched. 400+ wrestlers come together in Easton, PA and raise $61,902 for St. Jude Children’s Research Hospital. 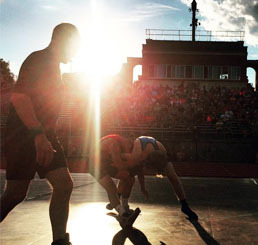 More than 80 wrestlers earn free entry into the tournament by raising $250+ before the event. Pin Cancer partners with Wrestling Brand – TERRA GRAPPL’R to launch a PC wrestling shoe. The shoe is set to release in 2018. 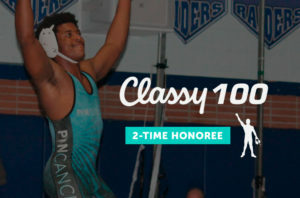 For the second straight year in a row, Pin Cancer makes Classy.org’s Top 100! Over 4,000 nonprofits are scored to achieve this award. 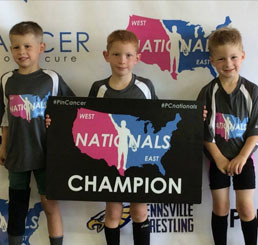 $75,000 in donations was raised thanks to wrestlers who competed in the 2018 PC Nationals. 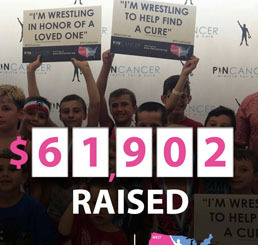 Pin Cancer is a 501(c)3 nonprofit organization aimed to unite the wrestling world in the fight against cancer. Copyright 2019 Pin Cancer - Wrestle for a Cure. All Rights Reserved.